Earlier this month Apple’s CEO Tim Cook traveled to China. It was his second trip to the country since taking over as CEO , and his third trip in as many years. By contrast, Factiva and Lexis Nexis searches, as well as Walter Isaacson’s biography, turn up no instances of his predecessor, Steve Jobs, ever taking an official trip to China during his tenure as Apple’s CEO. Cook’s sky miles reveal China’s changing place in Apple’s business strategy, from place of manufacturer to primary consumer. China has long played a major role in Apple’s success after the company began moving much of its manufacturing from the U.S. to China and other Asian nations in the 1990’s. Today it works primarily through a contractor, Taiwan-based Foxconn which produces Apple products primarily at its Shenzhen factory in Southern China that employs around 270,000 workers. Now this aspect of China in Apple’s business plan may decline. Although Apple has made no formal announcements, China’s declining labor pool is pushing wages and working conditions up leading many companies to look elsewhere for their future. It stands to reason that Apple will join the coming exodus away from China in the not so distant future. Increases in labor costs will either cut into the company’s profits or be passed onto consumers, a not so appealing prospect given that Apple products like the iPhone and iPad are already high-end in an increasingly crowded markets. Furthermore, a combination of higher expectations from Chinese workers and growing scrutiny from international human rights groups has already forced Apple to pressure Foxconn into raising the working standards of its employees in factories that make Apple products. More regulated working conditions reduces the “flexibility” of these factories, which Apple executives have cited as a key advantage China offers over American factories. Meanwhile, commensurate with any drop in Apple’s manufacturing operations in China will be an increased campaign to sell its products to China’s rising middle class. During his trip early this month Tim Cook said he expects China to overtake the U.S. as Apple’s biggest consumer market, although he did not give a specific date of when he expects this to happen. “China is currently our second largest market. I believe it will become our first. I believe strongly that it will," Cook told state-run Xinhua News Agency. The prediction is not unreasonable. Despite being a late-comer to the Chinese market— the first legal iPhone sales in China did not take place until 2009— Apple is already adored in China. Steve Jobs’ death in October 2011 saw an outpouring of grief on China’s social media sites like Weibo, China’s equivalent to Twitter. Within days there were 93 million posts on the subject. At the time that was the most postings on any one subject in Weibo’s history, according to the Los Angeles Times. In January 2012, Apple had to temporarily halt the sale of iPhone 4s in mainland China after riots broke out between consumers trying to buy the devices. All of this bodes well for the Silicon-Valley company as China’s new leadership seeks to rebalance the economy away from an export-driven model by increasing domestic consumption. At the 18th Party Congress in November the Chinese government set the goal of doubling the country’s 2010 per capita income by the end in the decade. That would mean in 2020 the average Chinese would make roughly U.S. $8,500 annually. The urban population is likely to earn substantially more than this number, however, if current trends persist. According to Bloomberg Businessweek the average urban dweller in China currently makes 21,810 yuan ($3,493) a year compared to the 6,977 yuan ($1,118) his or her rural counterparts earns. This also has to be measured against the fact that China is already the largest smartphone market by volume surpassing the U.S. in 2012 when it was estimated by some to command over a quarter of the global market. Still, Apple faces a number of significant obstacles to capturing the Chinese market. First and foremost is the expense of its high-end products. Although the release of Apple products may cause riots in upscale Beijing neighborhood, the trend in China’s increasingly crowded electronic markets is towards cheaper products. Already Apple appears to be losing out, with the research firm IDC announcing last month that Apple slid to 6th place in China’s smartphone market in the 3Q of last year, down from number 4 in the 2Q. While many Chinese consumers are going for smartphones priced at around U.S. $150 and below, Apple’s suggested retail price for its iPhone 5 in China is U.S. $199 for the 16GB model, U.S. $299 for a 32GB one and U.S. $399 (U.S.) a 64GB model. Still, 2 million iPhone 5 were sold in China during the first weekend it was released last month. This exceeded the initial sales of the iPhone 4 or iPhone 4s. 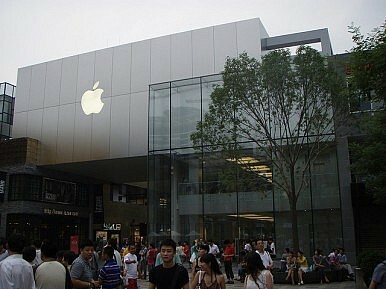 Furthermore, Apple is taking measures to help offset the price of its products for Chinese consumers. Last week it announced that it was offering credit to Chinese consumers with China Merchants Bank credit cards who purchase their products through Apple’s online store. Consumers on the mainland can now apply for up to 12 months of interest-free credit for any product costing between U.S. $48 and $4,800. Additionally, Apple’s online store will now offer Chinese consumers the options of paying for their purchases in 18-month installments at a 6.5 percent interest rate or 24-month installments at an 8.5 interest rate. There have also been reports that Apple will offer a new low-cost version of the iPhone 6 when it’s released. Another issue for Apple in China is distribution. Although Apple has licensing agreements with China Unicom Ltd. and China Telecom Corp., the second and third largest cellphone providers on the mainland, it has yet to ink a deal with China Mobile, the largest telecom provider by subscribers in the world and on the Chinese mainland. This is an issue for Apple; China Mobile has more than twice the number of subscribes as Unicom and Telecom combined. Not surprisingly, Tim Cook met with China Mobile executives during his trip earlier this month. Yet the two companies have been in talks for around four years and according to an October report by Deutsche Bank, China Mobile is a long way away from signing a deal with Apple. Adding to Apple’s distribution woes is the lack of Apple retail outlets in China. Currently there are seven stores in mainland China and four in Hong Kong, up from merely six stores in March 2012. Among the newly constructed retails store is the one Apple opened in Wangfujing in Beijing last November, its largest in Asia. Still without more competitively priced products and a deal with China Mobile, one wonders if it will be enough. Zachary Keck is assistant editor of The Diplomat. He can be found on Twitter: @ZacharyKeck. iPhone 5s and iPhone 6: Release Date? Features? New iPhone Rumored to be "Low-Cost" iPad 5 Alert: Apple's New Tablet to be "Significantly Lighter and Slimmer" Apple's iPhone 6: Where it Could End Up, What We've HeardWill Asia Kill Apple?